NEW FROM NORTH KOREA - PYONGYANG TRAFFICGIRL BARBIE! 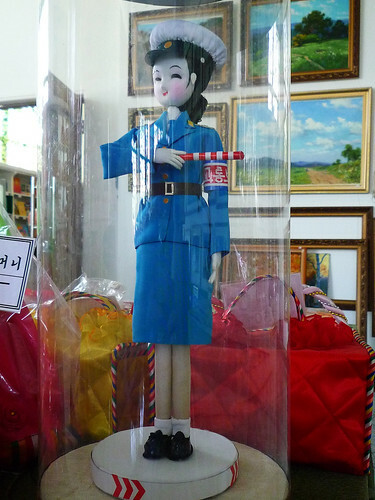 Apparently the North Koreans are now making trafficgirl dolls! Unquestionably they realize the universal popularity of their traffic ladies, and are responding to international demand. Outstanding! Too bad they don't have a mail order service, I'd take one. Now how about that traffic girl music box idea? After seeing these PTG barbie dolls, It wouldn't surprise me if they were working on a music box. . I'll buy one next time. I did not think I could get it home. I think I will try harder. I need one for my office. My photo of Larry (above kissing her) says it all. I think Larry needs a girlfriend. I did think so at the time. He did hit the basement of the Yanggakto hotel (purely for research purposes of course) to tell us if the legends were true. They were true enough. Someone should get a North Korea shop to open up an ebay store. I bet they will make lots of money. As funny as it sounds, I would pay ~a lot~ for one, just for the novelty of having something from North Korea in my house!! maybe we can get the KFA to add to their list?? KFA seems to sell 'propagandish' type things, the PTG doll is more af a novelty item - but who knows, they may consider it. It would certainly be a huge seller. A couple ebay stores selling DPRK stuff - no traffic girl dolls yet. lol - that's a lot of people's reactions. Oh man, the look on this guy's face is intense. Yep - one girlfriend, stat.